Developers Milestone have revealed the first bit of official gameplay for the upcoming MotoGP 18. Despite the game coming out next month, we still haven’t seen much from the game, but Milestone is getting ready to unveil the title as we get closer to its June 7 release date. 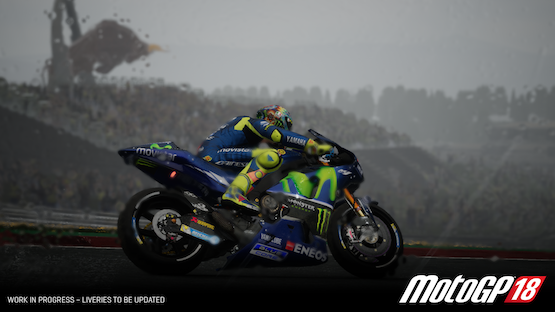 The game will once again aim to give players the opportunity to take part in the most popular motorcycle racing show on earth and will feature official content from the 2018 MotoGP season. A compelling career mode to climb the ladder from Red Bull MotoGP™ Rookies Cup to MotoGP™ class, including an innovative bike development setup, to significantly increase the bikes’ performance, as well as the MotoGP™ ID to keep track of such progress. MotoGP 18 will launch on June 7, 2018 for PlayStation 4, Xbox One, and PC, with a Nintendo Switch launch coming shortly after.